Visitors can pick their preferred sky colour and express reactions to a hamburger in this interactive exhibition, designed by New York studio PlayLab Inc for Brooklyn design venue A/D/O. PlayLab Inc collaborated with designers, artists, writers, musicians and photographers to create the installation for the Design Academy at A/D/O's Common Sense season. Following the creative hub's opening Utopia vs Dystopia programme, the event will focus on the ways that design helps form identities and shared experiences. With the aim to explore perception, PlayLab Inc's immersive exhibition features six stands dispersed around the 23,000-square-foot (2,130-square-metre) space. At each station, visitors are invited to grab sheets of text from each station that most fit their viewpoint, eventually building up their own exhibition catalogue. "The experiences convey the idea that there are always different perspectives on a same subject," said PlayLab Inc.
"Each experience is accompanied by printed pages, which serve as takeaways," the studio continued. "The goal is for visitors to grab the pages as they go and have a complete catalogue at the end of the experience." 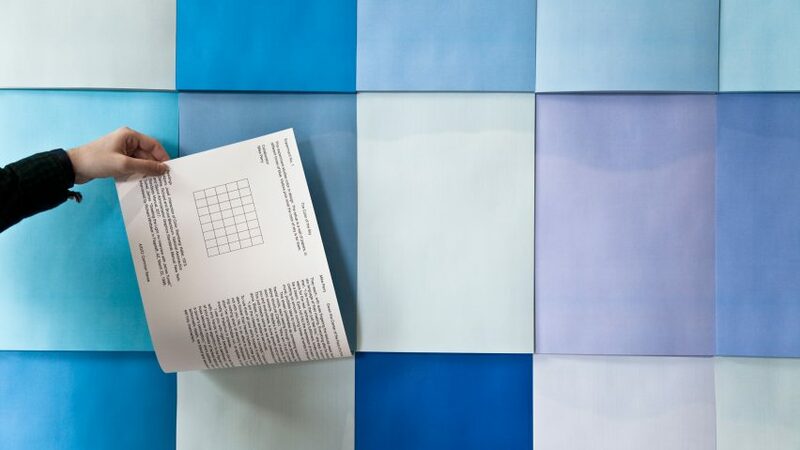 A wall of coloured papers in hues of blue and purple cover the first stand, where visitors pick the sheet that most fits their perception of the colour of the sky. The next station, called the Flip Side of a Burger, features a hamburger housed in a glass box, alongside four red posters with different captions that represent various reactions to the meat product. To explore the relationship between design and art, Playlab Inc has placed four identical baseballs in a vitrine alongside hugely varying price tags. The costs range from $1,000 (approximately £774) for a ball used by a famous athlete, to a priceless ball linked to a childhood memory. Three custom-made symbols decorate a panel in the fourth stall, alongside choices for alternative titles. Visitors can also attach their own descriptions to the wooden wall with post-it notes. For experiment number five, creative duo Wash and Fold created a series of posters in the meeting room that reveal the behind-the-scenes of Instagram photographs. It includes an image of a neat pile of clothes contrasted with the surrounding mess and a shot of a salad titled "Straight from the garden" with the contradictory empty food packets. Attendees to the bathrooms can chose whether they are delighted or bored by a sound installation created by Ben Warfield that plays continually while they use the facilities. The seventh, bonus installation is located in the courtyard – where Assemble has built a clay-extruding temporary factory. Here, wooden bird boxes mounted on walls are emblazoned with popular three-letter acronyms, like OMG (Oh my god). A/D/O is located in Greenpoint, Brooklyn, inside an old warehouse that was transformed by New York studio nArchitects, with funding from car brand MINI. PlayLab, Inc's exhibition will be open throughout summer 2017. The Common Sense festival, which launched 13 May 2017, on will includes talks by Jay Osgerby from London-based design studio Barber & Osgerby, co-founder of London-based studio Bompas & Parr Harry Parr and the New York Times' perfume critic Chandler Burr. Its opening coincides with the annual NYCxDesign festival, taking place across the city from 3 to 24 May 2017. Photography is by Jean Paul Gomez.